Why we have a problem with web-based gait analysis recommendations. What is Visual Parallax and how does it affect gait analysis? Is your video gait analysis really telling you what you think it is telling you ? We recently were asked by a student at a physical therapy school to help with a teaching case. They asked us to look at a gait video to assist in outlining some things in the case. Here was our response. We are happy to look at the video for you so you and others can learn. Just please know, as we say all the time here on the Gait Guys, that without an examination that what we are all seeing is not the problem rather the persons compensatory strategy around the dysfunctional parts. Plus, video negates binocular and parallax viewing so things that would stand out in in a exam where we are physically present will be masked quite a bit in/on video or on a computer screen. We try to minimize these visual losses by getting multiplanar gait video views (sagittal from front and back and coronal from left and right sides) but even these will not fill the visual gap from transferring data from 3D to 2D and then trying to interpret a 3D answer from the 2D. But it is the best one can do with our technology today unless you use a body suit sensor system, and then you still have the limitations of "what you see is not the problem, its their compensation” so one still needs the physical exam to put the puzzle together. Here…….. read this if you are wondering what we mean. *This blog article below which we wrote 6 years ago is the heart of what we wanted you to read today. Visual parallax and binocular vision both need to be understood so that you can better understand why what you see on your gait analysis video might not be what you think you are seeing. Seeing is one thing, knowing what you are seeing is another, knowing the limitations and the “why” of what you are seeing is yet another. What is Visual Parallax and how does it affect gait analysis? : Is your video gait analysis really telling you what you think it is telling you ? Have you ever watched someone’s gait, only to reach for your camera to capture a gait deficit digitally, and then later re-watch the video and have a difficult time seeing the same deficit? There is a logical answer. Vision exists with both eyes open (binocular), or with only one open eye (monocular). Our visual system uses all available depth cues to determine distances between objects, called physiological cues (actual or perceived differences), and psychological cues (experiential; or derived from past experience, or logical deduction). Our 2 eyes see the world from slightly different locations (or different lines of sight), so the images transmitted to the visual cortex (in the occipital lobe) by the eyes are slightly different (see left picture above, compliments of Wikipedia). This difference in the perceived images is called binocular parallax. The amount or angle can be measured by the angle or semi-angle of inclination between those two lines. The term is derived from the Greek parallaxis, meaning “alteration”. Our visual system is very sensitive to these “differences”, and binocular parallax is the most important depth cue for medium viewing distances (see right picture above, compliments of www.cns.nyu.edu). The sense of depth can be achieved using binocular parallax even if all other depth cues are removed. Nearby objects have a larger parallax than more distant objects when observed from different positions, so parallax can be used to determine distances. Usually video provides us with confirmation of we are actually seeing in 3D. Beware, visual parallax may be playing tricks with you, as there is a discrepancy when translating 3D to 2D (cameras have one lens and are therefor monocular). Yes, binocular effect is lost in video; there is little depth perception with 2D and everything on the web, at this point, is 2D. A different vantage point (ie multiple camera angles: front, back and side) often offer a different perspective which is why we always suggest 3 views, but that too, is having 3 videos which are all 2D ! So this is why when you watch someone’s gait, even when LIVE on Skype or FACETIME, you have a difficult time seeing the same deficit that you might have seen had you been there in person enabling the components of binocular and parallax to come into play. Trust us, we are astonished all the time when we see something in a client's gait, and we reach for our phone or ipad, only to have it be barely present on the video because of the 2D capture limitations. Remember, what you see (actually or on video) IS their compensation, NOT the problem, but it can often lead you to the problem. Pelvic drift to right during stance often means weak Gluteus medius on that side. Is that the problem? Maybe. However, “Why” is the bigger question. Is it from the foot? The Knee? the hip? Or maybe central and involving the vestibular apparatus? We examine, try to make a change, and see if it sticks. So, in the future, keep in mind some of these limitations of what you are diagnosing off of video analysis because what you are seeing is a monocular interpretation of the real thing. Some information has been lost in the process of monocular motion capture. We are sure that in time video analysis will reach the 3D realm, and solve this problem. Things tend to occur in threes. This includes congenital abnormalities. Take a look this gentleman who came in to see us with lower back pain. So why LBP? Our theory is the lack of internal rotation of the lower extremities forces that motion to occur somewhere; the next mobile area just north is the lumbar spine, where there is limited rotation available, usually about 5 degrees. this is his left hip in full internal rotation. note that he does go past zero. note the internal tibial torsion. a line dropped from the tibial tuberosity should go through the 2nd metatarsal or between the 2nd and 3rd. 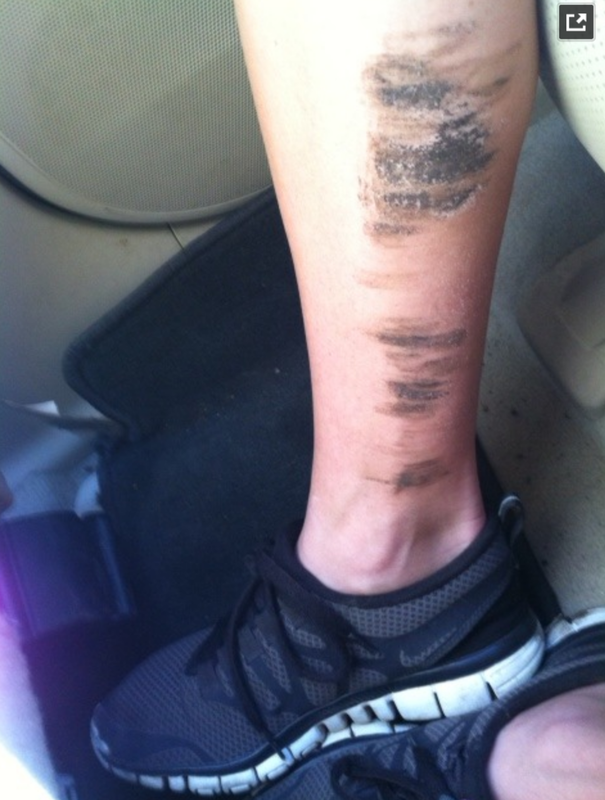 Running paths and the cross over gait and narrow step width. This is a walking/running path. Do the runners on this path only have one foot? No, of course not, they are running on a line. Yes, we cannot get away from this cross over gait, a terribly narrow based gait pattern. Do we know that this angled attack of the foot towards the mid-line asks more from the frontal plane stabililzers in the hip and core ? Yes, research has shown this. Do we know that the gluteus medius helps with foot targeting? Yes, research again shows this, and thus a weak gluteus medius will enable a more medial targeting. Lesson: the gluteus medius helps with foot targeting on the swing leg, and hip stability on the stance leg. With a Cross Over gait, Do we know that we need better control of internal spin of the limb, better foot pronation durability and many other durable abilities that we might not need so much of if we were better stacking the joint? Again, yes. 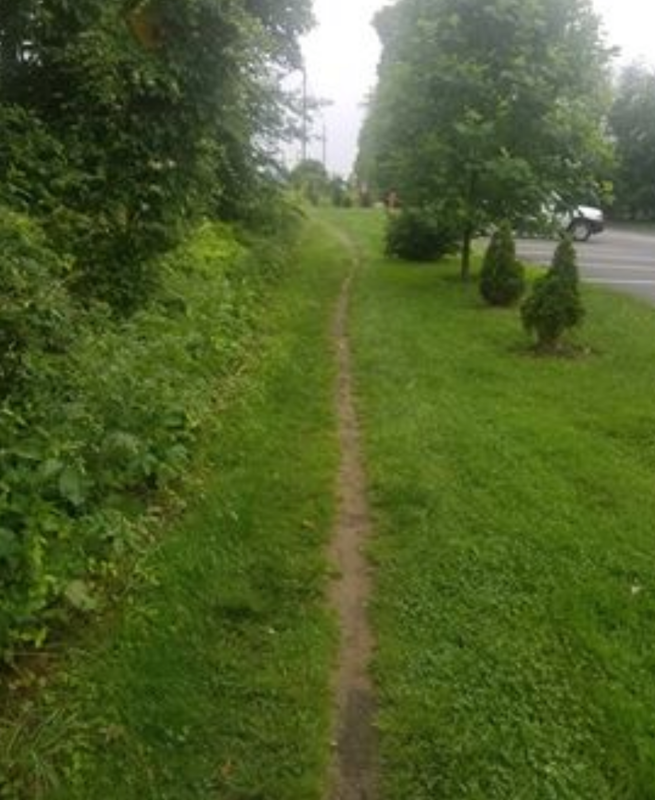 We confirmed with the reader who sent the photo that this is not a bike path (at this location this path is for walking folks, the bike path is adjacent to the parking lot). The reader (Terry B. (thank you Terry)) astutely mentioned that people are walking on a line. If they had some spacing, step width, there would be 2 trails and a tiny patch of grass between them. But, now, this line, the line is a queue for others to "walk the line" and join the cross-over nation. We have written gobs of articles on this cross over topic, the few benefits, the teeter-totter "risk / reward" factor, the drawbacks and injury susceptibility factor and we have spoken about it on our podcast probably 100x. IF you wish to entertain that rabbit hole of knowledge, just goto our website and type it into the "search" box. "cross over gait"
Increased unilateral foot pronation and its effects upward into the chain. This right handed concrete worker presented to our office with right-sided lower back pain. He was lifting a bag of concrete moving from left to right which she estimates weighing between 60 and 80 pounds. He did this repetitively throughout the day and subsequently developed right sided lower back pain. The pain is in the suprailiac region and is described as dull, achey. Is exacerbated by right rotation and right lateral bending. His exam found him to have a right sided anatomical leg length discrepancy, tibial left (see above) and femoral retro torsion on the right with no internal rotation of the hip past 0 degrees (see picture of full internal rotation of the right hip and cmpare it with the left); left side had approximately 10 degrees internal rotation. He also has bilateral internal tibial torsion, R > L. Palpation findings revealed tightness in the lumbar multifidus and quadratus lumborum with a loss of lateral bending to the right at L2 through L4 and a loss of flexion about the right sacroiliac joint. Lower extremity reflexes were 2+ with bilateral symmetry; sensation to vibration was intact at the distal phalanges; motor strength was strong and graded as 5/5. Think about the implications of his right-sided leg length discrepancy first. This places his foot and a relative supinated posture compared to the left. Remember that supination is plantar flexion, inversion and adduction. His femoral retro torsion on the right limits his internal rotation at the hip. When his foot planted with a diminished progression angle secondary to the internal tibial torsion, and he has to rotate from left to right, very little, if any motion, can occur at the right hip and therefore must occur in the lumbar spine. Remember the lumbar spine has very limited range of motion begin with with most of that occurring at the L5-S1 junction, depending upon its anatomy. Now superimpose a long lever load and rotary force. Back pain! We instructed him on proper lifting technique and also talked about keeping the shoulders and hips in the same plane when lifting or load. 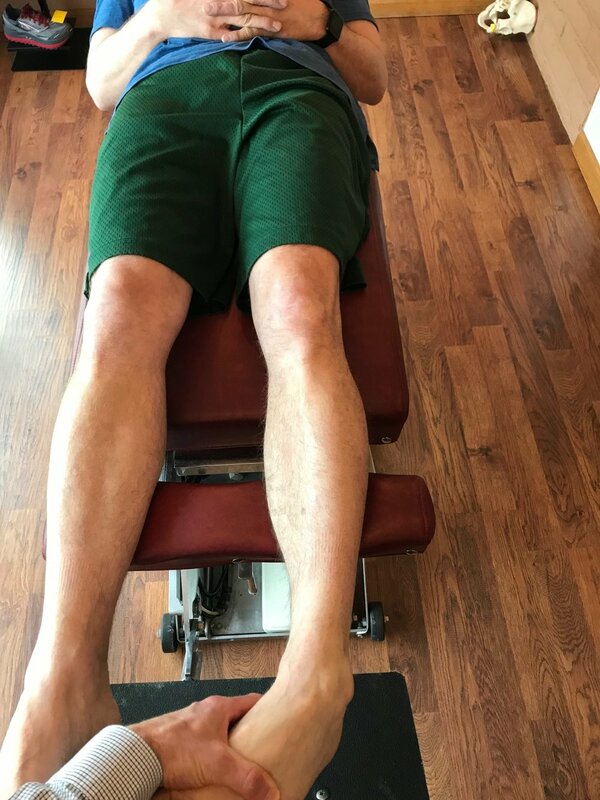 If he does need to lift a load and spin unilateral on his right lower extremity, we asked him to externally rotate the right lower extremity. He was treated with manipulation and neuromuscular acupuncture. Dr. Ivo Waerlop, one of The Gait Guys. Low back tightness in runners. Spinal muscle fatigue. Do you as a runner, or a helper of runners, ever experience low back tightness on a run, particularly a long run ? These muscles can fatigue just like any other muscle; we just generally do not think of them in this manner. Be sure to endurance/fatigue test your runner's lumbar erector muscles. Sure, we need a strong durable core, but in an endeavor like running, where there are constant acceleration/deceleration as well as impact loading forces over long distances, we need these muscles to be just as durable as any other. And, do not forget that we have to control the constant anterior and posterior pelvis oscillations in the sagittal plane (APT and PPT) that correspond to the acceleration and deceleration phases of gait. "Previous EMG studies of running have shown the lumbar extensor muscles to be active at foot contact and during early stance (Thorstensson, Carlson, Zomlefer, & Nilsson, 1982). This early activation of the back extensors will act to limit forward flexion of the trunk as energy is absorbed in the lower limbs and the CoM decelerates. During this deceleration phase, the thorax moves into forward flexion and there is a small corresponding posterior tilt of the pelvis as gluteus maximus acts to extend the hip." Loading protocols for achilles tendinopathy. We all know now that the smartest way out of a chronic tendinopathy is painfree, progressive loading. We, as many others have found, that isometrics serve the initial process well because there is no movement through a painful arc, the isometrics can help reduce the neurologic pain loop, and we can more easily find positions where there is no pain in the tendon. This allows us to load the affected tendon, without adding insult to the tendon portion that is injured. It them prepares us for the weeks to months of eccentric and concentric loading that is often necessary to restore function. Keep in mind that some of the literature indicates that some tendons never fully heal, but we replace things with a better functioning of the remaining competent tendon. This study found that there was an improvement in pain and function as early as 2 weeks. You might find this interesting because on imaging tendon structure does not change within 2 weeks and muscular hypertrophy is not seen for at least 4 weeks following inception of a loading protocol (Murphy). Thus, we all need to continue our education and understanding of central pain mechanisms. Meaning, that these initial early changes, are in part, and maybe a huge part, are neurologic. Rate of Improvement of Pain and Function in Mid-Portion Achilles Tendinopathy with Loading Protocols: A Systematic Review and Longitudinal Meta-Analysis. Murphy M1,2,3, Travers M4,5, Gibson W4, Chivers P6,7, Debenham J4, Docking S8, Rio E8,9. When the Windlass is lost. Here, this case again (hallux amputation), when the Windlass is lost or at the very least, impaired, what holds up the arch? Without the winding of the plantar fascia through hallux dorsiflexion (toe extension) and without the FHL (flexor hallucis longus) we lose major engineering advantages to lift/support the arch and control pronation variables. Tibialis posterior, tibialis anterior, peroneus longus, mostly, are what is left. So when these guys are suffering (ie, tendinopathy etc) it could be due to the other previously mentioned engineering marvels being impaired. It is a team effort to keep the foot healthy and functioning without expressible pathology. *note the heavy flexion attempts of the 2nd toe, the next soldier in line, no surprise there. Now you should realize why you see this 2nd toe over-flexion attempts when even an existing, yet incompetent, hallux is present. This slide is part of a new presentation, one we will be doing a WEBEX on that you can all join in on, and it will be a new presentation for our onlineCE Wednesday night seminars. Now, go read this dudes blog, inspirational journey through big toe cancer. Thanks for sharing your story Kevin, and your case photos. (PS: presentation is almost done, so i will be in touch soon so we can go over it and collaborate). Heel lifts, Sole lifts and their impact on the EMG of the posterior chain. Look for us on iTunes, Google Play, Podbean, PlayerFM and more. Just Google "the gait guys podcast". Our website is all you need to remember. Everything you want, need and wish for is right there on the site. Interested in our stuff ? Want to buy some of our lectures or our National Shoe Fit program? Click here (thegaitguys.com or thegaitguys.tumblr.com) and you will come to our websites. In the tabs, you will find tabs for STORE, SEMINARS, BOOK etc. We also lecture every 3rd Wednesday of the month on onlineCE.com. We have an extensive catalogued library of our courses there, you can take them any time for a nominal fee (~$20). Our podcast is on iTunes and just about every other podcast harbor site, just google "the gait guys podcast", you will find us. Remember the rockers? We have done a series on this in the past. Remember there are three: heel, ankle and forefoot. We are going to concentrate on the forefoot today. As a reminder, forefoot rocker occurs at the 1st metatarsal phalangeal joint (big toe knuckle) as the tibia progresses over the forefoot during forward movement. You NEED 50 degrees to do this competently; you SHOULD have 65 degrees. When you don’t, you have a condition called hallux limitus. This could be from a number of reasons, from overpronation in the mid foot, to a bunion, to faulty firing patterns of the muscles which help to descend the 1st ray (the extensor hallucinations brevis, the peroneus longs and the short flexors off the toes). Pretty much, ANYTHING that causes a dorsal and posterior shift of the 1st MTP axis will cause limited forefoot rocker. Take a few minutes to review it in this video with Dr Ivo Waerlop of The Gait Guys. NO hip internal rotation? Forget the glutes, have you looked at the femur? Some developmental versions involve the femur. The degree of version is the angle between an imaginary line drawn through the condyles of the femur and an imaginary line drawn through the head and neck of the femur. This is often referred to as the femoral neck angle or FNA. Beginning about the 3rd month of embryological development (Lanz and Mayet 1953) and reaches about 40 degrees (with an average of 30-60 degrees) at birth. It then decreases 25-30 degrees by adulthood to 8-20 degrees with males being at the lower and females at the upper end of the range. The FNA angle, therefore, diminishes about 1.5 degrees a year until about 15 years of age. Femoral neck anteversion angle is typically symmetrical from the left side to the right side. What causes torsion in the first place? By the sixth month in utero, the lumbar spine and hips of the fetus are fully flexed, so perhaps it is positional. Other sources say it coincides with the degree of osteogenesis. There is a growing consensus that muscular forces are responsible, particularly the iliopsoas or possibly the medial and lateral hip rotators. Additional changes can occur after birth, particularly with sitting postures. “W” sitting or “cross legged” sitting have been associated with altering the available range of motion and thus the FNA, with the range increased in the direction the hip was held in; W sitting causing increased internal rotation and antetorsion and cross legged causing external rotation and retro torsion. There are at least 3 reasons we need to understand torsions and versions, They can alter the progression angle of gait, they usually affect the available ranges of motion of the limb and they can alter the coronal plane orientation of the limb. 1. fermoral torsions often alter the progression angle of gait. In femoral antetorsion torsion, the knees often face inward, resulting in an intoed gait and a decreased progression angle of the foot. This can be differentiated from internal tibial torsion (ITT) by looking at the tibia and studying the position of the tibial tuberosity with respect to the foot, particularly the 2nd metatarsal. In ITT, the foot points inward while the tibial tuberosity points straight ahead. In an individual with no torsion, the tibial tuberosity lines up with the 2nd metatarsal. If the tibial tuerosity and 2nd met are lined up, and the knees still point inward, the individual probably has femoral ante torsion. Remember that a decreased progression angle is often associated with a decreased step width whereas an increased angle is often associated with an increased step width. See the person with external tibial torsion in the above picture? 2. Femoral torsions affect available ranges of motion of the limb. We remember that the thigh leg needs to internally rotate the requisite 4-6 degrees from initial contact to midstance (most folks have 40 degrees) If it is already fully internally rotated (as it may be with femoral retro torsion), that range of motion must be created or compensated for elsewhere. This, much like internal tibial torsion, can result in external rotation of the affected lower limb to create the range of motion needed. Femoral retro torsion results in less internal rotation of the limb, and increased external rotation. Femoral ante torsion results in less external rotation of the limb, and increased internal rotation. 3. femoral torsions usually do not effect the coronal plane orientation of the lower limb, since the “spin” is in the transverse or horizontal plane. Femoral antetorsion will be perpetuated by sitting cross legged, which forces the thigh into external rotation. Crawling patterns and the Bird Dog look alike, but they are clearly not. Do you understand this ? Crawling and Bird Dog, a subtle but important difference. - the left hip is in extension, pairing appropriately with the right shoulder extension. 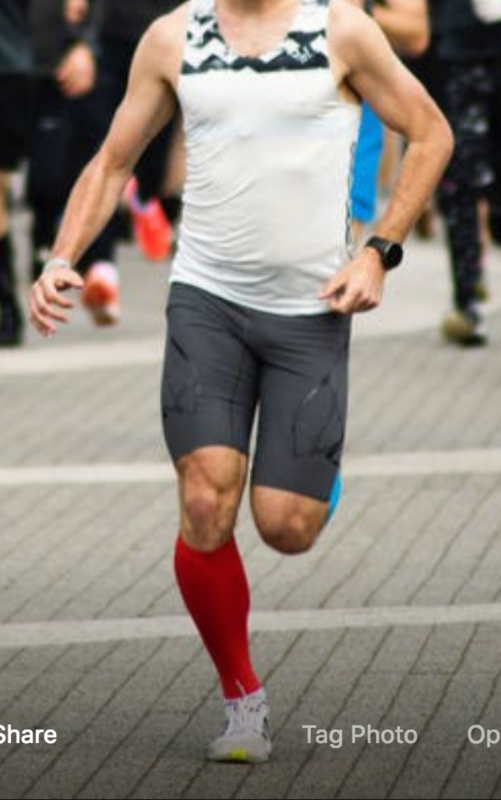 - similarly, the left shoulder is in flexion (it is over head in this photo, just like in the other photo of the runner similarly doing the same patterning but standing up, meanwhile the right hip is in flexion. * take the photo of the runner in the green shirt, and put him in a quadruped crawling pattern as you will see that it is the same pattern as the one of me in the crawling posture. * This is not bird dog, as seen in the photo, do not confuse them. The Bird Dog exercise is not neurologically correct for the reason of training the proper crossed patterning from a neuro perspective. Note that in the 2nd photo, the bird dog, the same left arm is in flexion, but his left leg is in EXTENSION ! If you want to use the bird dog to teach core engagement, that is one thing, but do not think you are coordinating normal gait patterns or the proper crossed response. This is why we do not use the Bird Dog with our patients, it goes against training fundamental gait patterns. This first photo of me in the black shirt is normal, natural, neurologically correct, cross crawling. Don't believe us ? Get on the floor and crawl like an infant, it is no where near the bird dog exercise, in crawling the coupled crossed extension and flexion responses are NOT conflicting. So, just because the Bird Dog "sort of looks like crawling" do not get it confused with crawling, because it is not. It is a mere balance exercise, some use it for the core stability, but it is one based on UN-fundamental neurologic patterning we use every day.......something called gait, and running, things we do in our sports. So understand what message you are sending to the CNS. We are not saying the Bird Dog does not have value, not at all, but if you are not thinking about what it actually is doing, you might be driving patterns you do not want. The Bird Dog rehab exercise is neurologically incorrect. Know what you are asking your client to do, and why..
Is this Bird Dog standing up? No, look more closely. Photo #1: pull that right swing leg outwards with your abductors/external rotators. Do not let the knee drift inwards, it will lead to that foot targeting the midline. Plus, because of the neurologic links, it will encourage the left arm to cross the mid line (see yesterdays FB blog post). The upper limb movement can shape lower limb movement. An aggressively narrow cross over gait is undesirable in many aspects, it might be more economical, but it has a wallet full of potential liabilities. IF you train your machine in a lazy manner, it is not unlikely it will perform as such. Get that knee under the shoulder, not under your head. - the left arm is in flexion and the left knee is in flexion. This is neurologically correct cross crawling. This is neurologically correct cross crawling. Don't believe us ? Get on the floor and crawl like an infant, it is no where near the bird dog exercise, in crawling the coupled crossed extension and flexion responses are NOT conflicting. So, just because the Bird Dog "sort of looks like crawling" do not get it confused with crawling, because it is not. It is a mere balance exercise, some use it for the core stability, but it is one based on UN-fundamental neurologic patterning we use every day.......something called gait, and running, things we do in our sports. So understand what message you are sending to the CNS. Arm swing, cross over, head over foot? Here is a Birdseye view of someone in full stride gait. The left leg and the right arm are into flexion and external rotation. The right leg and left arm are into extension and internal rotation. We discussed this in depth on our lecture on wednesday night. These counter movements drive,and are driven by, the anti-phasic properties of normal gait. Now, lets posture some thoughts with the head-over-foot mentality (which we do not subscribe to(listen to podcasts 135-136)). . . . You can see the clear relationships here of coupled motions of the limbs. Now imagine that you forced a cross over arm swing, pumping arm Swing across your body. This is shoulder/arm adduction. So what do you think is likely going to happen in the lower limb? Yes step width narrowing, i.e. crossover gate/Leg adduction. By forcing the arms to cross the midline you are strongly encouraging the legs to do the same thing. As we have discussed many times previously, the arms can shape the movement of the lower limbs even though the lower limbs run the primary patterns of which the arms are driven from. 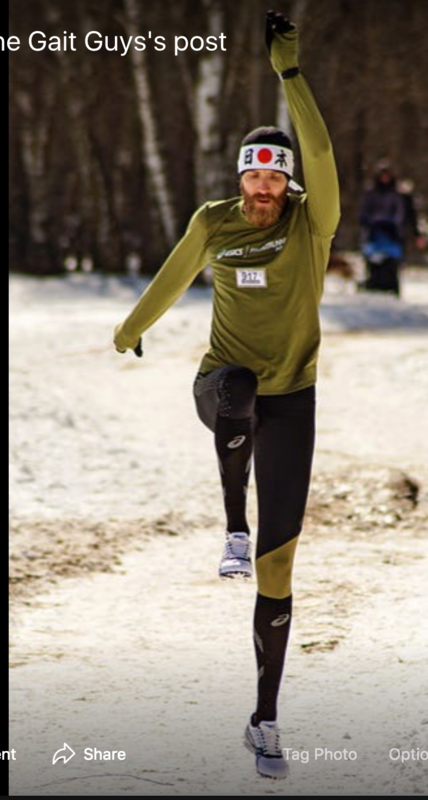 So if you want a crossover gait , which we have for years documented research showing biomechanical challenges, and something we see many injuries driven from, go ahead and coach and train your arm swing across the body. (narrow step width), or the gal loading the head and COM inside the foot (less narrow step width) ? It is not hard to suspect who is gonna be faster and more powerful from these photos. This however does not mean on is more durable, more or less injured, more or less efficient but logical debates and thought experiments can be made here. Sure, some one is going to say one is a distance runner and the other is a sprinter. Yes, and our point is that the sprinter is not head-over-foot, the one with all the highly suspect flaws is head over foot ! Wider step width means more glutes. Go ahead, walk around right now with a very narrow step width and see how little efficient glute contraction you get, then walk with a notably wider step width, and you will see wider means more glutes. Keep your COM moving forward, not oscillating back and forth sideways over each stance foot, that is a power leak. The distance runner appears to be demonstrating less optimal in technique, appears is the key word here. Say what you want, but a decent argument might be made as to one of these runners being weak and very likely at greater risk for injury, the other is suspect to be strong and durable, and likely at less risk for injury. If you ask us, but what do we know . . . . it is all a thought experiment, but based on some pretty decent ideas. So, again, was ask . . . . which one do you want to be ? The hip flexors do not cause initial hip flexion.